I wrote this three weeks ago and then forgot to take the file to Chicago, duhh. I assume everybody’s seen the film by now, but I’m not sure what else to do with the review but post it. Saw John Carter with a few geek friends, all of them (but me) EEs. It got lousy reviews for the most part, but I was intrigued by the idea of a quarter-billion dollar pulp novel. Because I know what pulp novels are (and because I read A Princess of Mars when I was 15 or so) I was by no means disappointed. Guys, it’s a pulp novel. This means that it’s either about cleavage or else bashing your enemies to a pulp. Disney made this one, so the cleavage is minimal, and the pulping quite bloodless. The costuming and CGI creations, on the other hand, were breathtaking in a sort of half-Spartacus, half-Steampunk way that we don’t see very often. (I really can’t think of another example, though the very uneven 1961 George Pal film Atlantis, the Lost Continent comes close.) Much of the film was shot on location on an alien planet called Utah. The rest came out of whole CGI cloth. And that, my friends was worth seeing. The tusked, four-armed native Martians called Tharks looked absolutely real, right down to the eyes. They fidgeted, they pouted, they even wept, and they did not all look alike. It is a credit to the production quality and attention to detail that in other films the Tharks might be consider monsters; here they were more or less the bad boys you stayed away from in high school or (very) occasionally befriended. There actually weren’t a lot of monsters, once you discount the Tharks as ugly but mostly human dumbasses. 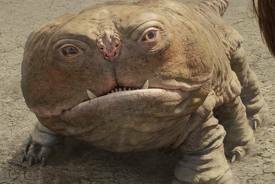 One of them, however, was my favorite living thing in the whole film: Carter’s six-legged Martian dog sidekick Woola (technically a calot) who might accurately be described as Jabba the Mutt. I liked the human characters a lot less. After all, I’ve already seen Spartacus. Carter himself (Taylor Kitsch) was forgettable beefcake. The bald guys were unconvincing, and reminded me of mysterious, hair-challenged heavies in a multitude of bad media pieces all the way back to Ming the Merciless. The princess-scientist Deja Thoris had remarkably durable eye makeup considering the roughousing she engages in. Then again, so did Sophia Loren in the underappreciated 1957 big gun epic The Pride and the Passion. (So, in fact, do most movie heroines who aren’t ugly by design.) 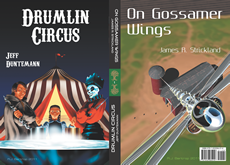 The Zodangans and the denizens of the city of Helium (what was Burroughs thinking?) were toga-epic extras, who brought all the passion of plum pudding to their parts. I twitched every time I heard someone say, “…then Helium falls.” Hey, if Helium falls, why do we fill blimps with it? The steampunkish walking city of Zodanga was a nice touch, explaining as it does why Mars appears to have long lines spanning its deserts. That’s just Zodanga tracks, and Zodanga has a lot of legs. Nonetheless, it’s a very big item, and if you’re not so dumb as to just sit and wait for it to step on you, I’d guess it’s fairly easy to outrun. Unfortunately, the one big thing that bothered me immensely in the film was key to the plot: Carter’s Supermannish ability to jump a hundred feet straight up, supposedly because of the lower gravity on Mars. Sorry, no. Mars’s gravity is 3/8 that of Earth, so a 200-pound ruffian would still weigh 75 pounds. I might believe fifteen feet straight up, or 60 feet in a horizontal long jump with a good running start. And if Carter can, the slender and apparently muscular Tharks should be able to. Not so. That’s my main complaint, apart from the fact it’s sometimes difficult to tell exactly what’s going on. I’ll freely admit that I didn’t care. John Carter is about spectacle; fights among improbable flying machines, goofy aliens, and endless startling things purchased by the compound interest of Moore’s Law. Don’t expect it to make sense. (Alas, don’t expect it to make much money, either.) Resist the temptation to crack helium jokes. (If Deja Thoris is a Princess of Helium, why doesn’t she have a squeaky voice?) Just turn your brain off and enjoy the scenery. Your review was more positive than the report I heard from a friend (an EE, curiously enough) who also saw it, and had also read the original pulp stories. Sounds like it is worth a rental, at least. The Avengers and The Hobbit are the films that I am really looking forward to this year. The former should aspire to be good entertainment and not at all deep; I hope that the latter aspires to something more. Hobbit, sure–I doubt anyone in the free world will skip that one. But I’m not sure The Avengers would mean anything to me if Diana Rigg were not in it. A most inspiring character – though exactly what she inspired in young (then) males like myself… well its exactly what she inspires today in old men watching reruns. And I’ve often thought that Mrs. Peel did as much for women’s lib as just about anyone, a woman of great capabilities that were taken as a mater of course. Thankfully Steed was also played as capable, the respite from the usual bumbling male expected opposite such a female character. I saw John Carter last month, when it came out. A few differences from the book bothered me (wasn’t Kantos Kan a lieutenant rather than an admiral? walking city? shapeshifting villans? NO TWIN TOWERS OF HELIUM??? ), but all in all I enjoyed it immensely. Like you, I read the books at an early age — Heinlein’s “Number of the Beast” put me onto them. I was very surprised at the negative press the movie got, and I’m sorry that the sequels will probably never get made because of the poor box office performance. Knew that, of course, and I was once again playing on my age a little. Even in 1966, Mrs. Peel interested me far more than Iron Man. In fact, that’s true even in 2012. I’m a fan of both Avengers franchises. In the UK, the movie based on the comic book team has been re-titled Avengers Assemble, to prevent confusion with the classic British TV series. Jeff, I’ve been following Contra long enough to get the impression that you are not really a comics fan (not that there is anything wrong with that). Is that accurate? Oh — and Happy Easter! Accurate, though I don’t actively dislike them. I jumped from kid SF (Space Cat, Danny Dunn, The Enormous Egg, etc.) to Tom Swift, to borrowed paperbacks and (once I was 11) adult SF like Heinlein, Lieber, De Camp, Laumer, and Kingsley Amis’s wonderful story anthologies. Sidenote: The librarians at my local CPL branch wouldn’t let me take out books from the adult collection until I was 11, which irritated me hugely, as I was reading at college level by that time. That train didn’t stop at comics. My parents loathed them and refused to buy them for me. What little exposure to comics I had was at friends’ houses, and down at my cousin Ron’s house. Ron had stacks of comics of all sorts and I used to browse his stacks when I was there. I’d already been exposed to well-thought-through (if simple) kid fiction from the library, and most comics just didn’t make sense to me. Fighting crime in funny clothes? Couldn’t the crooks see you coming a mile away? The DC horror comics he had were repellent. (He was almost ten years older than I was and had some pre-CCA titles.) The only comic series I had any affection for was Metal Men, which I bought sometimes and brought home surreptitiously. The series didn’t take itself too seriously, so the lapses in logic didn’t bother me as much. I read a few of that oddity, Classics Illustrated, but only the Verne and Wells titles. Their War of the Worlds was pretty good as such things went, but the real thing was within my grasp by then. I’ve spoken of that other very odd Catholic comic book called Treasure Chest which we got at school. They were pretty dull stuff except very rarely (as with the weird story called “The Bear and the Wainwright) and I skimmed them when I looked at them at all. I understand the whole comics thing much better today than I did when I was ten. I did follow Elfquest while it was first-run, and pick up other oddments when I’m over at Gretchen’s. They remind me that I’m very good at imagining nonexistent things in sharp visual detail, so seeing someone else’s concept of Martian war tripods was a letdown. I saw them better, so comics had much less attraction for me.